Christmas is meant to be a time of joy and warmth. The lights spend a warm glow which is reflected with anticipation in children’s eyes. Christmas markets invite to enjoy a mulled wine or indulge in Christmas sweets. The lottery booths are a death trap for parents’ purses and a well for joy for the kids. However, this joy is relatively short lived. If the little gimmicks make it home at all in one piece, the joy is gone quickly. This little kicker game is the best example. At first glance it looks pretty cool but a closer inspection brings to light the lack of effort put into making this little toy. It is cheaply produced. And that is a nice description. First of all, the teams’ shirts don’t match. It is a cheap attempt to copy the Arsenal shirt of the mid-noughties with the logo of a mobile telecommunication company on their shirts. As it turns out, the letters resemble more an OZ. The bar for the red keeper is bent and makes goal keeping very difficult. 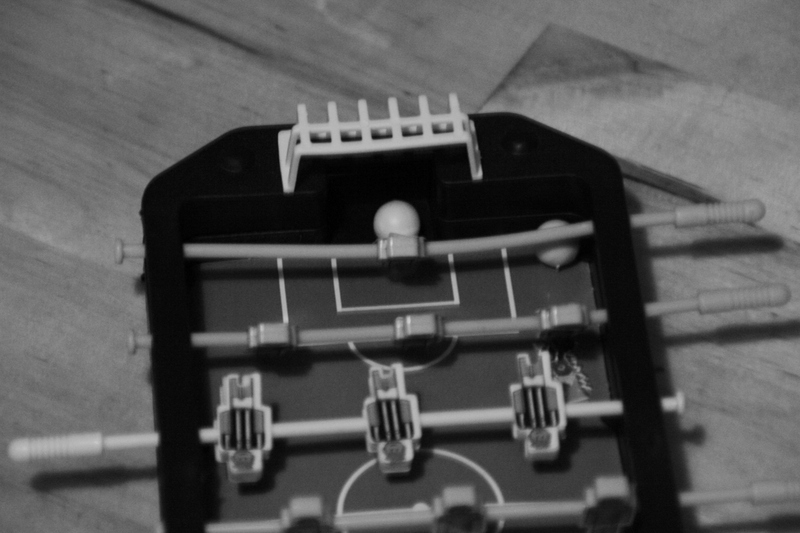 The pitch is made of card board and it is arched: the ball will roll in any corner without a player getting a touch. The shirts of the players fall off at the slightest movement or if it touches the ground, making any repairs laborious as fixing it again is not easy. 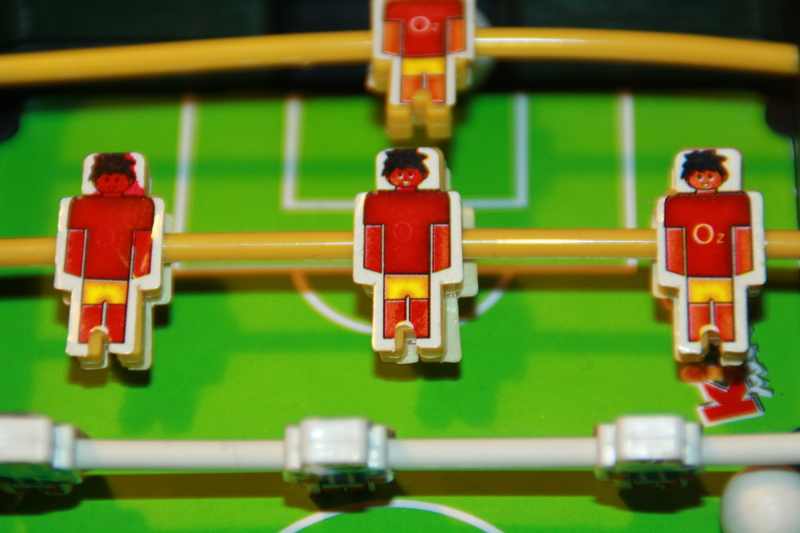 They even seem not to fit the player figures. The goals are small, very small suggesting a defensive mindset when producing this. The whole thing looks as though somebody has thought about producing a mini kicker for kids but has not considered that a little effort is required. As a result, the finish of this product makes playing tip kick almost impossible. Scoring a goal only happens by chance, if at all. It spoils the joy of a little kick-about on your kitchen table or elsewhere.